The Lady Bulldog soccer team headed to the Mack Chase Athletic Complex Saturday under warm, sunny skies with the intention of playing a pair against Deming and Santa Teresa. Mother Nature, however, had other ideas. The Lady ‘Dogs’ recent weather woes continued Saturday afternoon, as their 4:30 p.m. game against Santa T. was called off due to the wait that followed a severe thunderstorm that dropped large hail and buckets of rain on the area. The Lady Desert Warriors’ athletic director determined the squad needed to head for home rather than waiting for a later start. The two teams will be able to make up the game Saturday at The Mack. It was the second game in three days the Lady Bulldogs were forced to cancel, as their Sept. 15 bout with Alamogordo ended prior to the half due to lightning. The day wasn’t a total washout, however, as the Artesia girls picked up their sixth win of the season in a morning match against Deming, 3-2. The Lady ‘Dogs came out the aggressors in that contest, but it was the Lady Wildcats who would get on the board first, taking advantage of a defensive miscue to fire one in from short range just over five minutes in. It took the Artesia offense a bit to find their footing, but when they did, they did so quickly. Elisa Cardenas headed in a corner kick by Raina Wesson with 6:12 to go in the first half to tie the game, and Wesson launched the go-ahead goal on a lunging shot at the 4:37 mark to make it 2-1 at the break. Wesson would weave her way around the Deming defense five minutes into the second half for what turned out to be a crucial score. 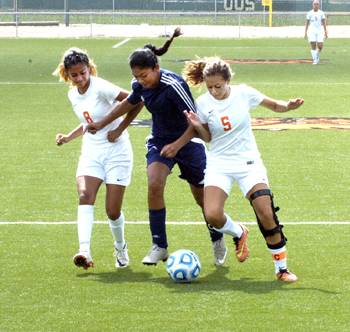 The Lady ‘Cats put one in on a cross in front of the net just over 10 minutes later, but Artesia was able to hold on through a largely defensive second half to preserve the 3-2 victory. 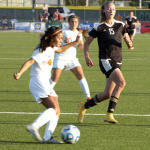 The Lady Bulldogs (6-3) will next host Carlsbad at 6 p.m. Tuesday at The Mack.